Cannes. 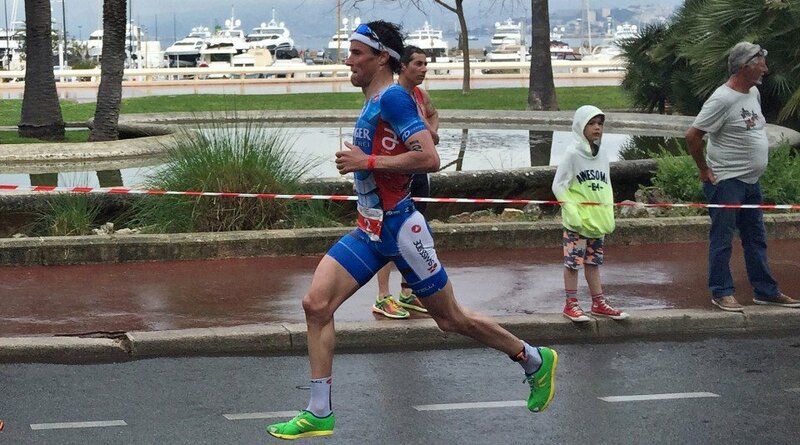 Andreas Raelert has started into the 2016 triathlon season with a good competition. At the Cannes International Triathlon he finished in third place behind the strong Frenchman Etienne Diemunsch and defending champion Giulio Molinari from Italy. Andreas Raelert had a total time of 3:31:52 hours after racing 2 kilometers of swimming, 80 kilometers of cycling and 16 kilometers of running. He crossed the finish line after a thrilling race just behind Etienne Diemunsch, who won the race in 3:30:08 hours, and Molinari (3:30:37 hours). "My first race of the year has been a very demanding competition," said Andreas Raelert after his finish, "I am very satisfied with this first real hard test under race conditions." The International Triathlon Cannes impressed Andreas Raelert not only because of its very selective bike course and a strong field, but also because of an impressive atmosphere. "I have to say a very special thanks to all spectators and to the organization team that brought up this event," said Andreas Raelert, "the atmosphere was really good. It was a great start into the season." Meanwhile, the race course was as tough as predicted. "It was clear that the bike course would be real tough stuff", said Andreas Raelert after the race, "therefore I tried to find a good mix of getting the highest possible control and taking the risks I had to take." Especially on the tricky descents it was important not to take full risk right away. Andreas Raelert came out of the water being about a minute behind Frederic Belaubre from France who led the field into T1 after 28:45 minutes together with last year's winner Giulio Molinari. "Unfortunately, my start into the race was a bit sleepy,” said Andreas Raelert, “so, I lost contact to Frederic." On the bike, the Rostockian started to control his race and paced himself in a group with Patrick Lange from Germany and Etienne Diemunsch. "When we hit transition then, Etienne was really flying into the run", said Andreas Raelert regarding the high-speed run start of the 2014 Duathlon short-distance World Championship runner-up. While the strong runner Etienne Diemunsch took over the lead on the run, Andreas Raelert also came closer to Giulio Molinari who had a solid lead after the bike course. However, the gap to Molinari was a bit too big to catch the Italian. "Overall, I am satisfied," said Andreas Raelert, "mainly because I discovered that my preparation for the season has not been too bad, although the weather conditions weren’t perfect in Rostock." After racing his season opener, Andreas Raelert is really looking forward to take the next steps.